Executive Dashboard enjoyed signficant code changes. The first of many was the conversion to a .NET application. This was a daunting task taken on by the talented coding staff here at Qualitech, awesome job everyone! Registry Editor, another major addition to Executive Dashboard is a new tool that allows the system administrator to edit the registry and maintain .INI files associated with the application with ease. Charting received some exciting changes with the addition of templates and wizards so that chart creation is a more simplified step. Related KPIs, allows the user to relate KPIs to one another so that when added to a dashboard view, all related KPIs are added in with the indicator. Indicator Tooltip Options for display Justification, Rationale, Recovery, and Description with KPI View Period page. View Dashboard has been added to the menu to allow users the ability to see a dashboard during the progress of building. ASP customers can now import from their local database to our servers to update Executive Dashboard. Qualitech Solutions took on new challenges and added new faces to our growing talented staff. We look forward to seeing QSI grow and become more successful in the coming years. 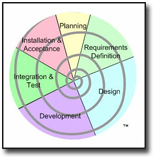 The Shell Method is an integrated software management process specifically designed for database aplications. It was built on software engineering methodology which combines the best of Agile Development and full scale project management. The Shell Method utilizes templates built on best-practice models and protocols (CMM, IEEE, RUP) to deploy a disciplined, uniform approach to software development and maintenance. The Shell Method is used by Qualitech to deliver compliance documentation to both the end-user community and the development team. This aids both the user in the operation of the softare aplication and the developer in locating the root procedures for a specific software function. Consistent with the current work environment, the Shell Method delivers this documentation on-line, in easy to navigate, reviewable and traceable form. From requirements to deployment our QSI team is able to utilize the Shell Method to provide flexible, highly domain-specific solutions for all our clients.